For the first time, commuters can take advantage of purchasing tickets online in four simple steps. The new facility, which will be available for customers from 3rd March, is a great way to buy travel without having to make a call, come into the office or carry lots of cash on the coach, saving time and giving customers even more flexibility. The new service allows commuters to choose between delivery or collection for Annual Season tickets and redeem other ticket types on the coach with an automated booking received by email. Customers will be able to register and manage their accounts online and will keep track of all past and current bookings allowing the user to manage their travel more efficiently, so no need to file receipts and tickets. Ian Fraser, Managing Director at The Kings Ferry comments, “We are continually updating our fleet of coaches and investing in new technology to provide a better experience for our customers and I’m delighted that we are now also able to provide online ticketing”. Customers will need to register an account in order to purchase tickets via the website, and a passport style photo is required upon registration for ID purposes. 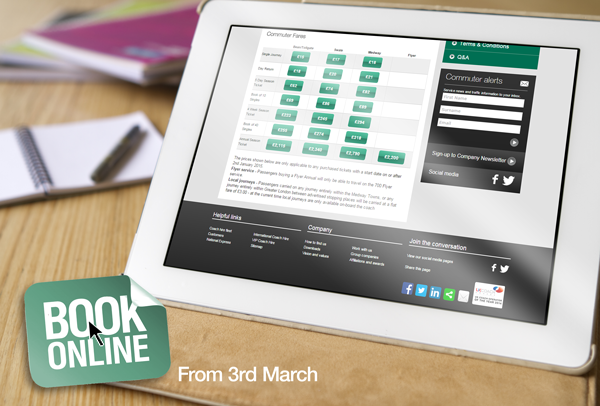 Customers can register in advance and the booking facility will be live from 3rd March. Customers can still purchase over the phone, at reception or on the coach but will not be able to take advantage of the online features designed to make your booking experience easier. Best BBQ Dishes for All the Family! Get Your Christmas Party Transport Booked! The Perfect Transport for Your Wedding! Its Time For Merlin Attractions! Business Travel Show 2019 - What a Show! Get planning your 2018 Festive Celebrations! Kings Ferry to transport the 2018 Soccer Aid teams! Notting Hill and Wembley Success! The World's Biggest Coffee Morning! Are you ready to get planning the best party of 2017? Where will this Summer take you? 13 months for the price of 12! Kings Ferry scoops 2 top coach awards! New VIP coach for Fulham F.C. Fancy a break this Easter? Family activities, Egg hunts and shows in the UK and Europe. Guess who we had on board? You can unsubscribe from receiving these emails at any time by clicking the unsubscribe link at the bottom of our emails.